This prominent and highly sophisticated business center offers a contemporary and professional business environment, in beautiful landscaped grounds. The center is conveniently located, offering easy access to Miami Airpot and downtown Doral. It also has a skilled multilingual workforce drawn from over 100 nations. 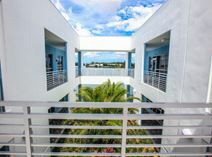 As well as free parking, the center is accessible by public transport including Tri-Rail Shuttle and buses. Accommodating up to six people the 55 fully furnished executive suites in this Class A building range from 110 - 450 sq. ft. and are close to Miami International Airport in Downtown Doral. Two meeting rooms are available for use while an on-site management team welcome you and your guests and assist with your business needs. Office sizes range from 110 - 450 sq. ft. and can accommodate up to six people. This contemporary and brand new business center provides modern décor and complimentary parking. Offering a range of workspace solutions, this center provides unobstructed views of the Dori Country Club, and is an easy drive to Miami International Airport. This building provides an opportunity for business owners to thrive in great office space and take in the many luxurious amenities Doral has to offer. This center is a premier provider of membership-based, flexible workspaces. The design is by Gensler, furniture by Herman Miller and other high-end brands, concierge level services, and premium level technology develop an environment and community that people love coming to work to every day. Enjoy a stroll through downtown Doral and experience the Miami life! Grab a bite to eat and hit the streets! Office suites offering contemporary furnished offices, conference rooms, friendly staff, and up to date technology. Easy access to Miami International airport. This exquisitely furnished and contemporary business center and corporate environment is one of the most commercially significant and prestigious office locations in the area, with a multitude of state of the art and technologically innovative facilities available on site, as well as a vast array of specialist services and inclusive benefits available to all occupying tenants. The regional transport links are also very good and make the building easily accessible.